My morse code training experience: In 1965 I built a crude buzzer by winding an electromagnet on a bolt and attaching the bolt and a metal can sounder to a wooden base. I remember what it looked like, but not exactly how it functioned. I used this to practice sending characters in newspaper articles. For receiving, I had an AMECO code practice record that was purchased at the Burnstein-Applebee department inside the Katz drug store on Glenstone Avenue in Springfield, MO. Once I had learned the characters, Joe Hill K0IVK sent code to me using a DX-20 transmitter into a light bulb load and I listened on his Hammarlund HQ-129X receiver. 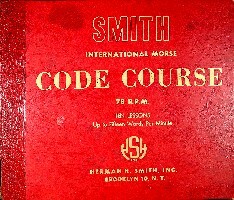 Joe also used a Smith code oscillator/monitor. I don't recall any problems learning the code. 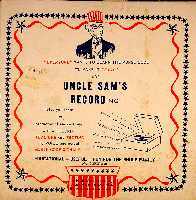 In February 1966 my family moved to Memphis, about the time I was ready for the novice test. In June I saw an article in the Whitehaven Star newspaper describing the upcoming Field Day. My father took me to Arkabutla Lake in Mississipi to the Field Day, where I met members of the Delta Radio Club. Most notibly among these was Wade WcKay WA4TFI, who lived near me and took me under his wing. 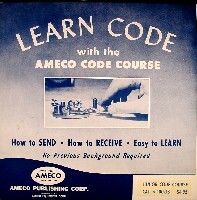 In short order Wade administered the code test to me and I became WN4EAB when the license arrived later in 1966. I sat for the General exam before the FCC at the Memphis main Post Office, a horrible echo chamber of a place, in October of 1967. The test was administered on an ATKO Mini-keyer, plus I actually had to send on a straight key - the examiner just listened for a bit then said "OK". Back then there were mandatory waiting periods between license classes, so after the prescribed times I became Advanced, then Extra class. The Extra code test again used the ATKO. Four of us sat around it. We began copying as the FCC examiner looked upon us. A couple of minutes into the test the examiner stopped me and told me I had passed. This time there was no sending test.